Set a button's state to either enabled, or disabled. The 'Enable or Disable a Button' action is used with the UX component. The action requires that you specify two properties. These properties specify which button you want to alter the state of and whether that button should be enabled or disabled. 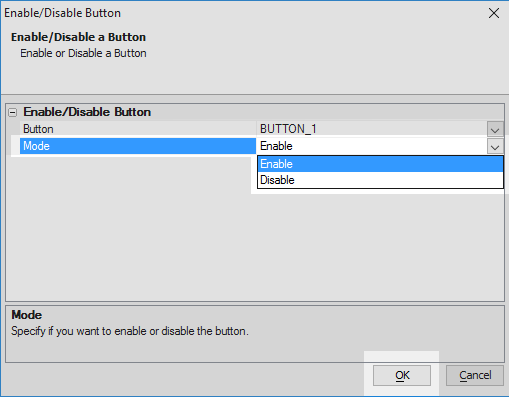 Specify the id of the Button to enable or disable. In order to demonstrate whether a button is enabled or disabled, we will first create a button that does something. 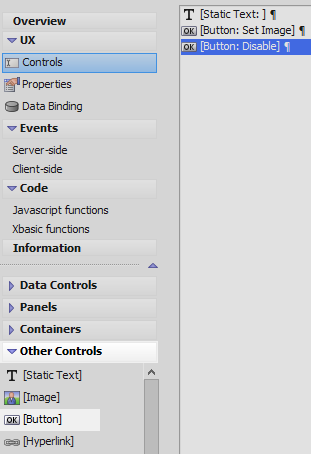 In the UX Builder on the UX Controls page open the 'Other Controls' menu. Click on the [Static Text] option. Open the 'Other Controls' menu and click on [Button] to add a button control to the component. Highlight the button. 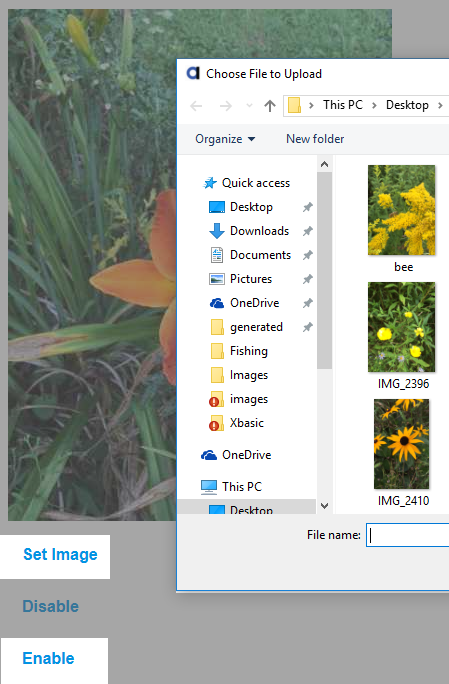 In the properties list on the right set the 'Button text' property to read 'Set Image'. 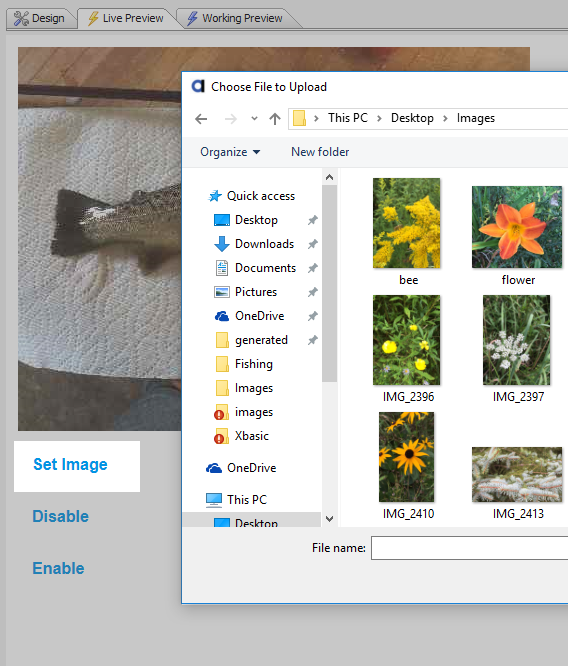 Type 'image' into the Filter list and select the 'Image Capture - Camera/Photo Library' option. 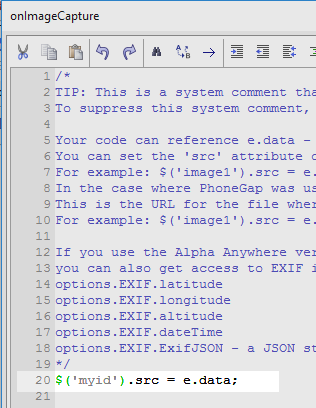 Click OK.
Add the following code to the onImageCapture definition. Click OK, OK, and Save. Open the 'Other Controls' menu and click on the [Button] control option. Highlight the new button in the controls list. Set the 'Button text' property to read 'Disable'. Type 'button' into the 'Filter list'. Highlight the 'Enable or Disable a Button' and click OK. 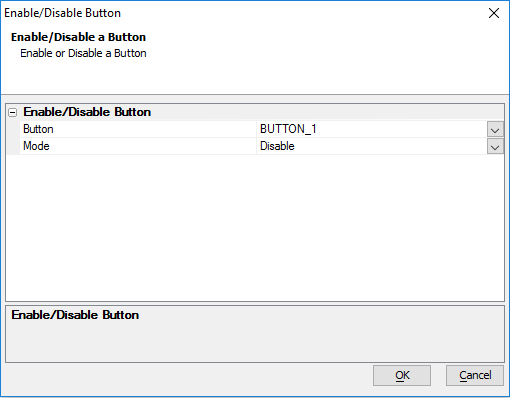 In the Enable/Disable Button dialog set the 'Button' property to be the button that was defined in the section above, 'BUTTON_1'. Set the Mode property to 'Disable' and click OK.
Click the [Button] control option in the 'Other Controls' menu again. Highlight the new button control. Set the 'Button text' property to read 'Enable'. Type 'button' into the 'Filter list', highlight the 'Enable or Disable a Button' action in the action list, and click OK.
Set the 'Mode' property to be 'Enable'. Click OK and Save. Run the component in Live Preview. Click on the 'Set Image' button. Choose an image to display. Click the 'Disable' button. The Set Image button should now be disabled preventing you from clicking on it and changing the image. Click the 'Enable' button. The Set Image button should now be enabled, allowing you to select a new image.